Cupboards Kitchen and Bath: All Employees Must Wash Hands! All Employees Must Wash Hands! Most of you probably don't know that I had a stint in law enforcement. Police officers and the like are vastly underpaid for the sacrifices they make to take care of our communities and should be lifted up in our society. One of the poignant things about the corrections industry is the evolution of the housing elements afforded to people that have been incarcerated. 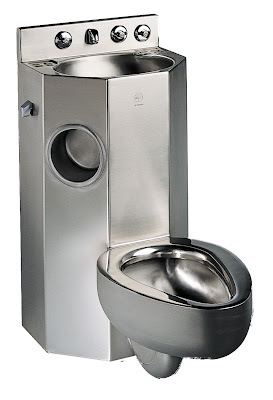 I was always impressed that someone came up with a way to make a toilet, sink, toilet paper holder and drain board out of a solid piece of stainless steel. The lovely unit above can be purchased through Bradley Corporation. Recently Caroma, a very forward thinking company that has always impressed with flushing systems, let out this little gem. In all seriousness, I am all about green-living and innovation, but anything that involves gray water just makes me think it goes in a camper. So my opinion is harsh, it's merely aesthetics. It's a prison toilet that has a real flush and a toilet seat. The space argument is legit, and some rooms just don't have the available spots for toilets and a lavatory(Overseas, many apartments have exceptionally small loos- so small you must come outside to change your mind). Folks in our neck of the woods have McShowers. Putting the sink on top of the throne would just never fly. One of the concerns that I have is the "flush effect". Everyone has heard that you should keep toothbrushes and etc. 6 feet away from the toilet as you will end up with little lovelies in your bristles. 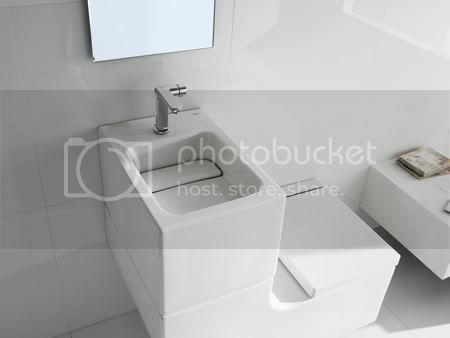 Will the basin being so close to the flush not create a very not sterile environment? 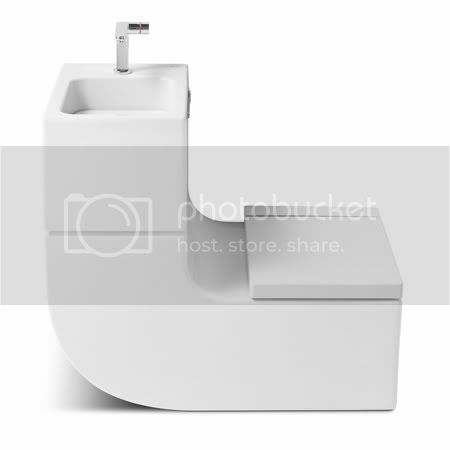 Caroma isn't the only one... Buratti and Roca Innovation has this toilet out and about. I do like the little platform on the side... Guess you can throw your legs up and relax just like you're in your recliner! I don't think I could bring myself to purchase one...I'd wonder if the water was clean and feel the need to use sanitizer afterwards. I'm with you all the way, Amy. What about using soap in the sink? Wouldn't it get WAY sudsy in the toilet? Yikes! Hey casbrown- Exactly! Does leave quite the mental image though, eh? Some good thoughts, Pam. I've seen lots of them used overseas and the watercloset spot would be another neat place. Totally agree on accessibility! We have a small loo here at our shop- I was able to find a wall hanging lavatory that is only big enough for your hands to fit in. It's off the toilet though, if for nothing else than my peace of mind! 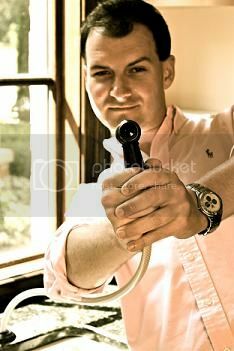 Ummmm, it's not the act of flushing that sprays bacteria all over a bathroom. It's the act that precedes it. As someone who lives in a part of the country with permanent water restrictions, I think this is a terrific idea! Paul- very interesting... Do you not subscribe to the Gerba research on the "toilet plume"? I agree that the act of certainly creates and issue, but I think the flushing plays its own role. As far as the green element? 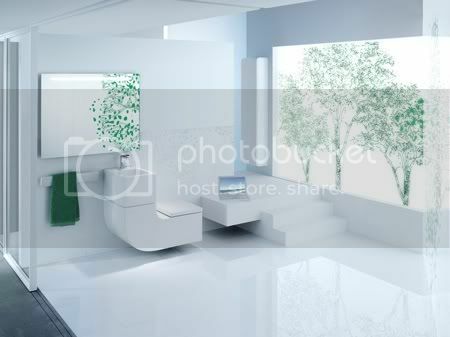 I agree with you 100% I hope that one day green design grabs some of the 'prettys' that I like and makes it easier on my eyes. Great thing about design- everyone has a different taste! Mythbusters dedicated a whole episode to it once. They actually tracked the bacterial plume. Trust me, it goes a lot further than six feet. Germ phobes who see it would welcome a move back to outdoor toilets! Um... Yeah.... No. Heck, I'm so short I couldn't even reach the sink if the commode was in front! The side one I could do, but... I don't think we'll be getting anything like that any time soon. Like in my lifetime. Ha! I remember this conversation. I haven't induced myself to like it any better. It did cause me to wonder if one washing their hands at the stainless one would straddle the toilet or what. I like the last one shown, but I just don't see the need. My grandad had something similar in a camper of his. He used to term it "Sh*t, shower, and shave" because everything was in a shower stall area. Oh yes... those camper all-in-one's are something else! You thought Jaws was scary?